In an endeavour to simplify many of my hobbies I made a last minute decision, in Christmas week, to purchase one of the new Grainfather brewing systems. My current, or rather former, brew system was a custom designed and built HERMS system which although it worked well it is rather large. I thought I would do more larger batches but as it’s mostly just me I have found myself doing a lot more smaller batches and with the release of the well-priced Grainfather it was a no-brainer to reduce the footprint of the brewery but also to simplify things as well. There’s also less elements in this one, so it means the other half can use the dishwasher, washing machine, kettle and a host of other household devices without me tripping a circuit – yes a design problem that I created. 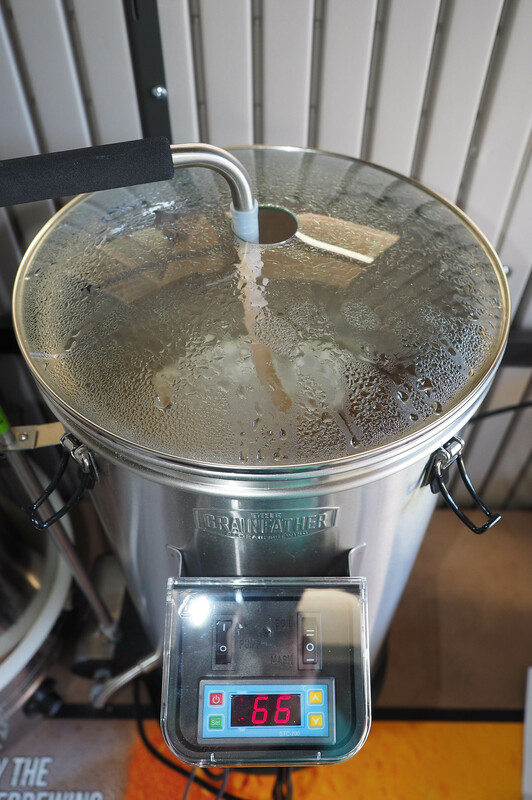 The day prior to the first brew day I prepped the Grainfather by assembling it (not as fiddly as videos show) and also put it through a cleaning cycle with the provided cleaner – although after the bottle is done I will be moving back to PBW as my preferred brewery cleaner. I put the grain through my Mashmaster Minimill and noted that the crush was a little fine. I hadn’t really noticed it before as the current crush worked well on the HERMS system but I had read on-line reports of the Grainfather preferring coarser crushes – I noted this down to adjust it later in the day. 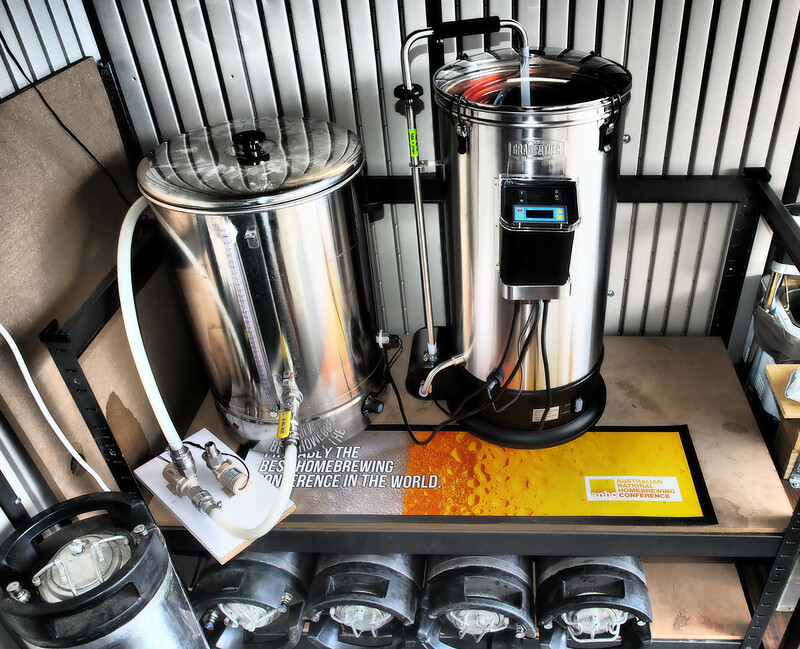 On brew day itself, I got up early and switched the HLT (urn with STC1000 attached) on to get the brew water up to speed and then headed out for a 5km run/walk with the family – don’t hold that against me! Once we returned and freshened up I headed out to the brewery to start the brew day and as the water was just right I pumped across the amount needed and mashed in. Perhaps it is because I’m not used to a smaller mash tun, but mashing into the inner basket required a little more stirring effort than I have previously been used to with my larger 70L pots – not enough to make a big deal but noticeable to myself. Once it was all stirred in, I attached the recirculating arm and switched the pump on for a 60 minute recirculated mash. At about the 20-minute mark I looked in and noticed that it had cleared nicely with the recirculation (could have happened earlier but I was tinkering around the brewery) – but I’m still concerned with the crush size, nothing is stuck but I will adjust it for the next brew. While mashing I measured up my hops for the APA, got a pack of Nottingham yeast out to warm up ready for rehydrating and prepared a litre of Starsan. After giving the fermenter a quick rinse out the timer started screaming out that it was time to mash out so the temperature on the Grainfather unit was quickly adjusted and I switched the element from mash to normal to ensure it ramped up quickly. While that was happening I switched the URN element back on to bring the sparge water back up to temperature. Next step with the Grainfather brew day was to lift the inner basket out in a similar fashion I did many years ago when I started BIAB brewing. Many on-line recommendations have said to run the Grainfather directly on the ground due to the need for lifting the basket but I had decided to use it on my existing brew stand – although I did remove a level to bring it down a notch. The device sat at about knee level (on me) so was not too far from the ground and I discovered that despite being soaked with liquid it wasn’t that much effort to lift (4.9 kilo grain bill) – if you did need assistance you would be able to rig up a pulley system easily enough. With the inner basket now locked off and sitting on top the mash liquid was draining from the mash into the kettle and I know switched the element to boil to save some time during the sparge. Here’s where I made the main discovery for the day – the sparge took a lot longer than I expected, and I suspect it had to do with the crush – essentially a stuck (or very slow) sparge. It still sparged through but was most certainly not the reported times I had read so I will be adjusting the crush on the next brew for sure. With the sparge now over the inner basket was emptied directly into the composter (nice!) and then rinsed out with the hose and set aside to dry. Not long after and the brew was boiling and ready for the first hop addition. I threw it in the hop sock (first time using one in years – another on-line recommendation) and watched on as the unit produced a very nice boil. It might be good to note here that due to the head-space of the unit a boil over could happen and it did foam up at the start, keep a stirrer or spray bottle handy for the initial boil to save making a mess and possible dangers from a boil over. The rest of the boil was pretty stock standard and before long it was done and time to connect up the included counterflow chiller. The chiller itself is a nice unit and I wasn’t sure if I would actually continue using it after the first brew or go back to my trusty plate chiller but it was easy to connect and after recirculating the wort through it for a few minutes to sanitise it, it produced some very nice cooling results – think I might have a plate chiller for sale soon. The chiller sits on top of the Grainfather unit and connects up very quickly for use. It’s a decent built chiller (although I have not seen many counterflow chillers before) and I’m pretty happy with the results. 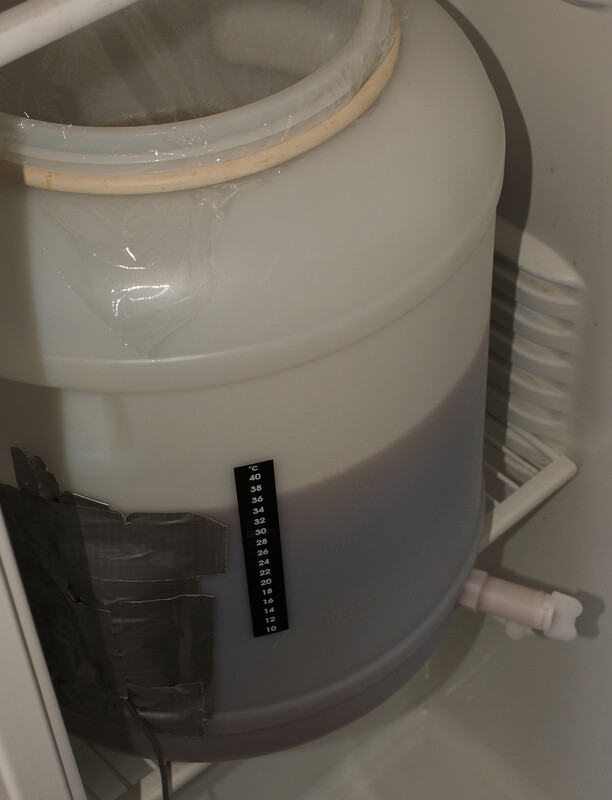 Once the chilling was done, I pitched the yeast and moved the fermenter to the fridge for a temperature controlled ferment and got ready to finish cleaning – which really wasn’t much. After dumping the trub out and giving it a quick rinse/scrub I filled it up with some water, cleaner and set it for a recirculation clean on the unit and chiller. Once that was complete I ran through some hot water to flush the system clean and dried as much as I could and the brew day was pretty much done. Overall, the first brew day on the Grainfather system was a success with a few little quirks noted or numbers not hit due to other little variations. 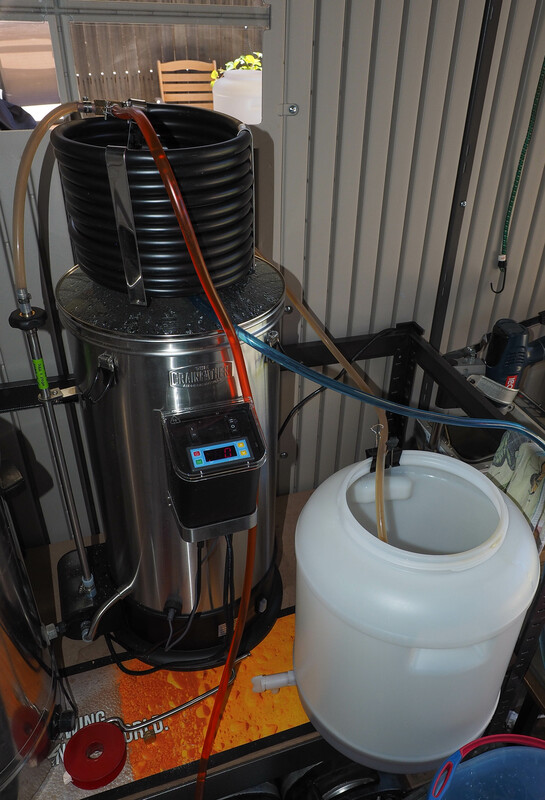 Being only the one vessel (OK, there is the HLT but it’s just water and basic connections so I’m not counting it right now) it was much easier (and quicker) to brew on than my old HERMS system (and even gravity system before that) as there was no switching vessels or hoses etc. So, is it a better than X system? Does it brew better beer? The questions and answers will vary from brewer to brewer, but most certainly it will not make better beer if your technique is not up to speed – there are many factors you still need to concentrate on. The Grainfather most definitely better-suits my current needs which is to simplify and downsize the brewery. I’ve decided that I have unnecessarily over-complicated many things and this is one item I have not been able to adjust for the better. Is it quicker? Not today. Mainly because of the slow sparge which I think is due to the crush but also due to the first brew day with a new system and the fact I was tinkering around after the brew day was technically finished – but then that’s normal for me. For me, this thing is almost perfect. Some may think it has some fiddly parts but after the initial set up it’s no more fiddly than any other system I’ve used and has many benefits. I enjoyed the day and can’t wait until the next brew day to put some things I’ve learned to the test and adjust the system (and my technique) further. For those worried about the build quality – this thing is very nice. I can’t (and wouldn’t) compare it to the Braumeister but the Grainfather is a well-crafted piece of kit and even with the silly season upon us – has fantastic support from both the NZ head office and Brisbane office as seen with my recent dealings and constant feedback and support on the Facebook Grainfather group – which company members are part of. Connects to the chiller to squirt CO2 through it and clear the water – post brew day. 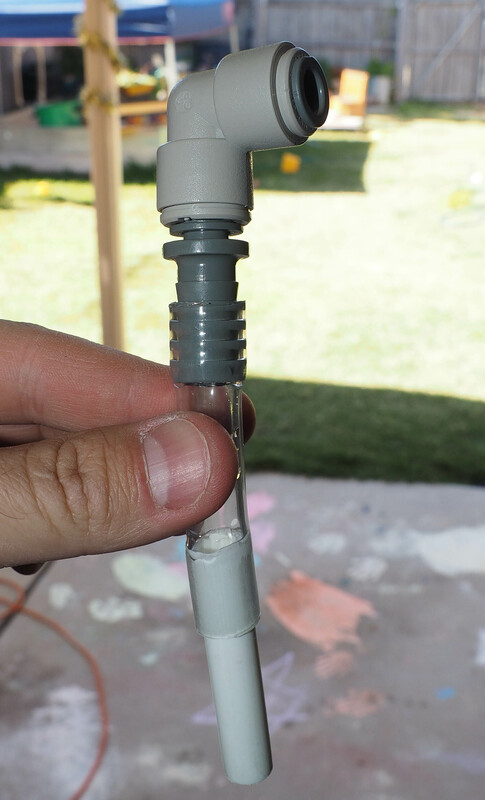 As I was cleaning up, I quickly came up with this little gadget to connect to the chiller and give a few quick squirts of CO2 through the chiller to force the remaining water out…and my wife said hoarding things wasn’t good – glad I had my little box of tricks sitting around. I’m planning to brew again in the next few days and then I’ll also dismantle the HERMS control box. I’ll redo a smaller control box, not dissimilar to the Grainfather one, that will control the HLT (urn) and the pump attached to it with the existing STC-1000. I’ll also film the next brew day (or one after) and post that at some stage. Next step is to then start selling of my old kit – anyone interested!? While they both make beer, they do it a little different. I haven’t had much to do with the BM so I can’t confidently go through differences but my beer from the GF at a much less-expensive price tastes all right to me – so I’m happy!